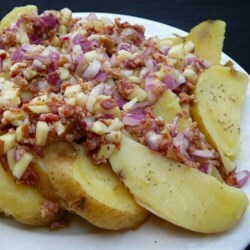 "This Spanish-style potato salad is tossed with apple, olives, onion and bacon. If you prefer, you can substitute diced ham for the bacon." Bring a large pot of salted water to a boil. Add potatoes and cook until tender but still firm, about 15 minutes; drain and cool. Cut each potato lengthwise into 1 inch spears. Place spears in 9x13 inch baking dish. Prepare the marinade by whisking together the white wine vinegar, olive oil, garlic, salt and pepper. Reserve 1 tablespoon and pour the remainder over the potatoes and turn gently to coat. Cover and refrigerate until chilled. Remove potatoes from refrigerator and bring to room temperature. Arrange potato spears on serving platter. Core apple and finely chop; add to reserved marinade. Stir in bacon (or ham), olives and onion. Spoon over potatoes and serve. This was very good. Similar to my mom's German Potato salad. I left out the black olives but I will try them next time. I'm thinking kalamata would be best. Served this with Bilbao Style Red Snapper from epicurious.com and sauteed garlic spinach. Guests raved! This was good and I would make this again.